Alan Grayson (D-FL) organized an historic hearing on US drone strikes. 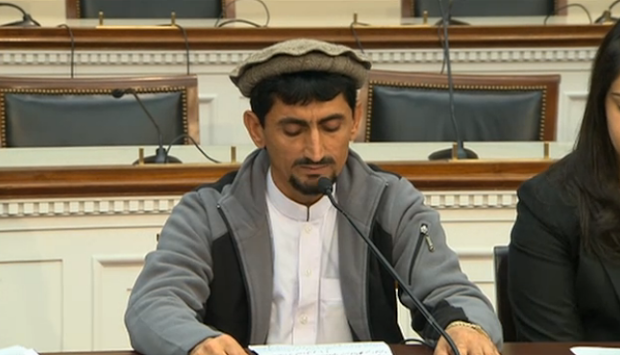 It was the first time that drone strike victims told their stories to U.S. elected officials at a hearing. The Rehman family traveled halfway around the world from Pakistan to tell the story of their families loss; the killing of the families grandmother. Only five members of Congress bothered to show up. What does this show about the United States political leadership? It is shameful. Below are three articles describing the scene and the families ordeal. We need to help them change the hearts and minds of Americans especially our elected leadership. Please share this with the White House (http://www.whitehouse.gov/contact/write-or-call) and your representatives in Congress. Nabila, a shy girl with startling hazel eyes and red streaks in her dark hair, along with her father Rafiq and 13-year-old brother Zubair have told the story of the day when a drone fell from the sky in their village in North Waziristan so many times that by Tuesday morning the tale was rote — even if this particular retelling was before U.S. lawmakers, at a briefing which was the first opportunity for members of Congress to hear directly from Pakistani victims of American drones. It was Oct. 24, 2012, the day before the Islamic holy day of Eid-al-Adha in North Waziristan. Zubair, Nabila, their little sister, five-year-old Asma and some of their cousins were all in the fields beside their house as their grandmother, 67-year-old Momina Bibi, showed them how to tell when the okra was ripe for picking. Zubair knew the drones were circling overhead; he has known their distinctive buzzing since he was even younger — a methodical zung, zung, zung, he says. Before the missile hit, he remembers hearing two clicks, like a trigger being pulled. Suddenly, day seemed to turn to night as they were enveloped in darkness and heat. Their grandmother, Momina Bibi, was thrown 20 feet away and killed instantly. Zubair, Nabila and the other children wounded in the attack were taken to a hospital. Zubair had shrapnel lodged in his leg — an injury that would take expensive laser surgeries to heal — while Nabila looked down to see her hand bleeding. Momina Bibi’s wounds were so severe that neighbors would not allow her sons to see the body, said Rafiq, a primary schoolteacher in Pakistan who was in town buying school supplies and sweets when the attack happened. In the days and weeks after, Rafiq said the newspapers reported that militants had been killed in the strike. As far as he knows, his mother was the sole fatality. He has never received an answer from the Pakistani or U.S. governments about why she was targeted or whether the strike was a mistake. The Rehmans traveled halfway across the world, from their remote village of Tappi, to tell their story and to urge lawmakers to put an end to the covert CIA program of “targeted killings” in Pakistan, Yemen and elsewhere. They also participated in an Amnesty International report about casualties of drones and a documentary by filmmaker Robert Greenwald, called Unmanned. According to the London-based Bureau of Investigative Journalism, 376 total strikes have taken place in Pakistan, killing up to 926 civilians and as many as 200 children. Since they arrived in Washington last weekend — their first time outside of Pakistan — the Rehmans have patiently sat for hours of interviews with dozens of media outlets in a dogged effort to change hearts and minds, with only a few breaks to go see the sights in the U.S. capital. The Obama administration, for its part, until recently did not even acknowledge the existence of the program. Now, officials say drone warfare is a precise and effective means to neutralize enemies in remote regions of the world where capturing terrorists is difficult and that civilian casualties are minimal. That rationale holds little solace for Rafiq and his family. Opponents of the United States have pointed out, beyond the legal and moral implications, that the U.S. policy engenders hatred of America and breeds extremism. But even after what his family has been through, Rafiq Rehman said he does not resent the United States. In fact, even after witnessing his first Halloween weekend in the States, he does not believe all that much separates him from Americans. “It’s very peaceful here. For the most part, there’s a lot of freedom and people get along with each other. They’re nice, they respect each other, and I appreciate that,” Rafiq told Al Jazeera. Rafiq, like so many fathers, wants his children to have peaceful lives and the best education possible. He hopes Zubair grows up to be a doctor and that Nabila is a lawyer. Ultimately, only five members of Congress arrived at the briefing to hear their testimony Tuesday morning: Rep. Alan Grayson of Florida, who organized the briefing, along with Reps. Jan Schakowsky, D-Ill., Rush Holt, D-N.J., John Conyers, D-Mich., and Rick Nolan, D-Minn.
What compelling interest did the U.S. government have in murdering a grandmother of nine and a midwife who helped deliver babies in the village, Rehman asked them. How can he reassure his children that the drones will not come back? Grayson said the briefing, held a full decade after the first drone strikes in Yemen by the Bush administration, was a promising start and dismissed the seemingly low attendance, noting that five members showed “a fair amount of interest.” Grayson doubted, however, that a full committee hearing with members of Congress would be called anytime soon. “The appropriate committees generally are staffed by people, if I may say this, who are friends of the military industrial complex, not even enemies, or even skeptics of it,” he said. Still, Zubair Rehman remained hopeful. Despite being heralded as the first time in history that U.S. lawmakers would hear directly from the survivors of a U.S. drone strike, only five elected officials chose to attend the congressional briefing that took place Tuesday. Pakistani schoolteacher Rafiq ur Rehman and his two children—9 year-old daughter Nabila and 13 year-old son Zubair—came to Washington, DC to give their account of a U.S. drone attack that killed Rafiq’s mother, Momina Bibi, and injured the two children in the remote tribal region of North Waziristan last October. According to journalist Anjali Kamat, who was present and tweeting live during the hearing, the only lawmakers to attend the briefing organized by Rep. Alan Grayson (D-Fla.), were Rep. John Conyers (D-Mich.), Rep. Jan Schakowsky (D-Ill.), Rep. Rush Holt (D-NJ) and Rep. Rick Nolan (D-Minn.). Before the handful of reporters and scant lawmakers, however, Rafiq and his children gave dramatic testimony which reportedly caused the translator to break down into tears. In her testimony, Nabila shared that she was picking okra with her grandmother when the U.S. missile struck and both children described how they used to play outside but are now too afraid. “I no longer love blue skies. In fact, I now prefer grey skies. Drones don’t fly when sky is grey,” said Zubair, whose leg was injured by shrapnel during the strike. “My grandmother was nobody’s enemy,” he added. “The onus is now on President Obama and his Administration to bring this war out of the shadows and to give answers,” said Gibson. The hearing convened by Rep. Alan Grayson marked the first time that drone strike victims told their stories to U.S. politicians in an official capacity. A Pakistani family made history in Washington D.C. when they testified on their experience witnessing and surviving a drone attack in the tribal areas of Pakistan. Three members of the family–Rafiq ur-Rehman and his children, 9-year-old Nabeela and 13-year-old Zubair–told their story in front of a handful Congressman at a hearing convened by Representative Alan Grayson (D-FL). It was the first time that drone strike victims told their stories to U.S. elected officials at a hearing. The hearing opened with a film clip from Robert Greenwald’s new documentary titled “Unmanned: America’s Drone Wars,” a movie that documents the civilian death toll of U.S. drone attacks in Pakistan. Hundreds of civilians have died by the hands of American drones, according to the Bureau of Investigative Journalism, which tracks drone strikes. Greenwald, who sits on AlterNet’s board, also spoke at the hearing. The story of the Rehman family was documented in an Amnesty International report released last week that criticized the U.S. for shielding its drone program from public scrutiny and for violating the laws of war. Amnesty International confirmed that a number of civilians have been killed by American drone strikes, in contrast to U.S. officials’ claims about low civilian casualties. The Rehmans told the Washington audience about the death of Mamana Bibi. While she was picking okra, a drone fired missiles at their home, killing Mamana and injuring Nabeela and Zubair. “ It was like she was exploded to pieces,” Zubair told theHuffington Post’s Matt Sledge. The Rehmans say they have no links to anti-American militants in Pakistan. They don’t know why a drone strike was fired at them. A Pakistani government source told Amnesty International that the strike may have been caused by “the bad luck of a Taliban member using a phone on a nearby road just before the strike,” as Sledge writes. The family has not received any compensation from the U.S. for the strike. The CIA and the White House do not acknowledge specific drone strikes. Alex Kane is AlterNet’s New York-based World editor, and an assistant editor forMondoweiss. Follow him on Twitter @alexbkane. I support this hearing but wasn’t it only for a Congressional subcommittee anyway? Most people only appear in front of a handful of legislators at a time, even when they were lambasting all the CEOs of financial firms. This was a briefing not a hearing. No actual business takes place. Nearly all of the time, congressmen send staff to take notes. It’s actually a good thing that even 5 congressmen came to a lowly briefing (which would be unheard of for a briefing). It shows that they very much care about the issue. My comment wasn’t approved yet but I meant that this is only a briefing not a hearing. It’s amazing that five congressmen went to a lowly briefing. We know that these five congressmen definitely care about the issue to personally take place in these briefings rather than the usual staffers. (Five congressmen at any briefing is pretty much unheard of). So it was “only” a briefing? It’s on a subject that we’re debating right now, and this is the FIRST we’ve heard from any of the victims of the drones. And incidentally, how many of the absent congress critters actually DID send their staff to take notes? My guess is hardly any. My other guess is that the congress critters were too busy meeting with lobbyists and getting special-interest money for their re-election. I doubt if attendance was helped by the fact that Alan Grayson was sponsoring it.